Homegroups are a way the we travel together as pilgrims on the way. And a privileged part of that is carrying one anthers burdens. But it takes time to develop the trust to be honest and vulnerable with each other. Some helpful ways to pray. Instead of just asking ‘what would people like prayer for’? As a more creative and thought provoking question. What area of my walk with God would I like to see develop? Which of the fruit of the Spirit do I most need right now? What part of my character is God calling me to work on at the moment? Just like the year, life has season. What season am I in? What is the weather like in my life at the moment? What issue is taking up most of my emotional energy at the moment? What is life giving/draining me right now? d) Simply say the Lords Prayer together, trusting that he has heard all that has been said. The Ignatian Examine is a way of quietly looking back on the day and seeing the ‘Consolation and Desolation’. 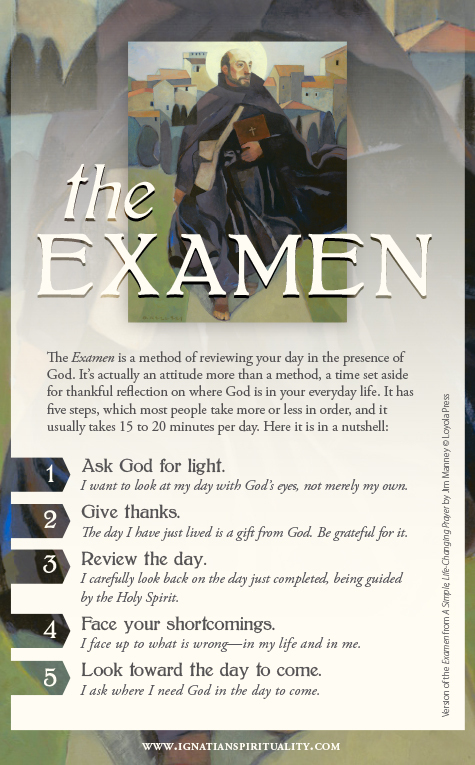 There is a lovely examine prayer card here.